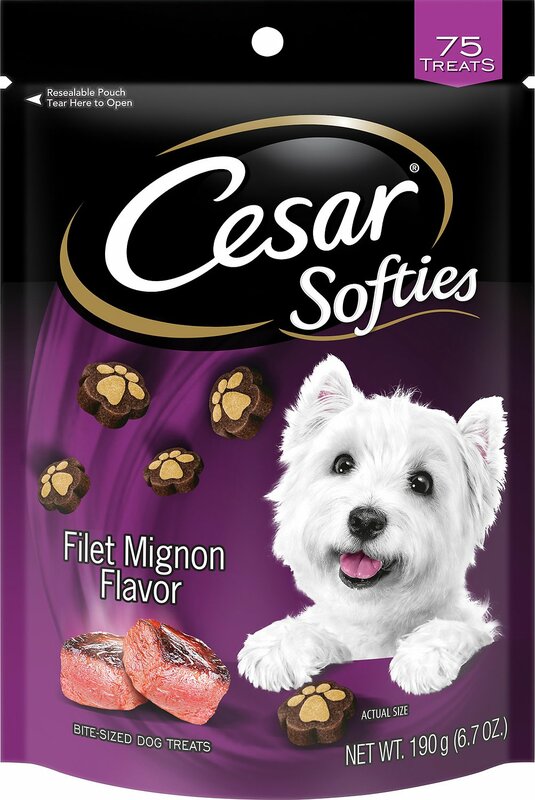 Your four-legged friend will feel extra special when you reward him with Cesar Softies Filet Mignon Dog Treats. He gives you love every day and you can love him back with these chewy, flavorful treats that are perfect for learning a new trick or for simply being his adorable self. Delectably soft and conveniently bite-sized, he’ll come running as soon as he hears you grab the bag. 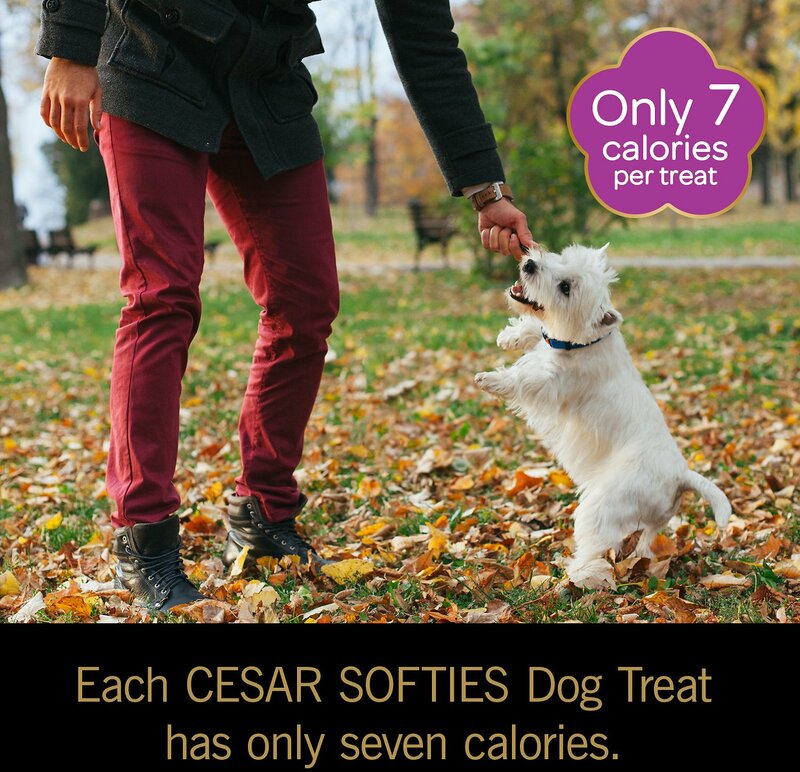 That delicious aroma and taste will leave him licking his lips for more, and with only seven calories per treat, it’s OK to indulge a little in these savory morsels. 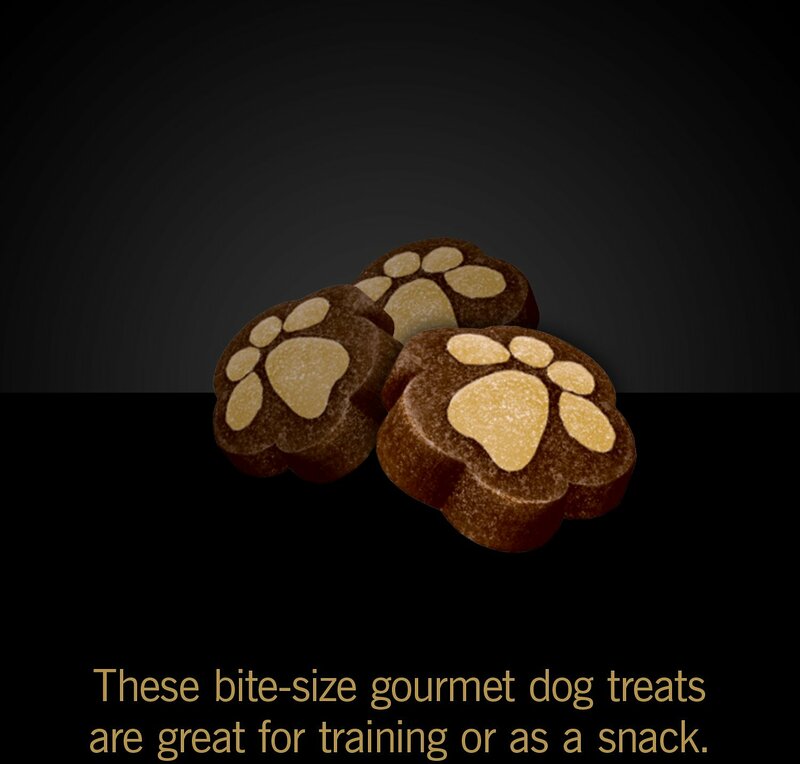 Love your best friend back with these chewy, flavorful, bite-site morsels shaped like cute little paws. 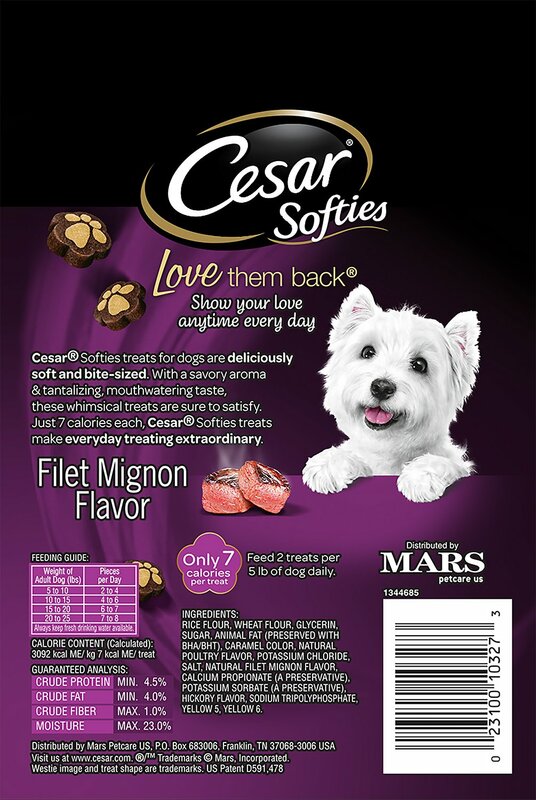 Savory aroma and mouthwatering filet mignon flavor is sure to be your precious pup’s new favorite treat. 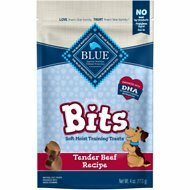 Great for house training, learning a new trick or just a delicious snack whether served whole or broken into smaller pieces. 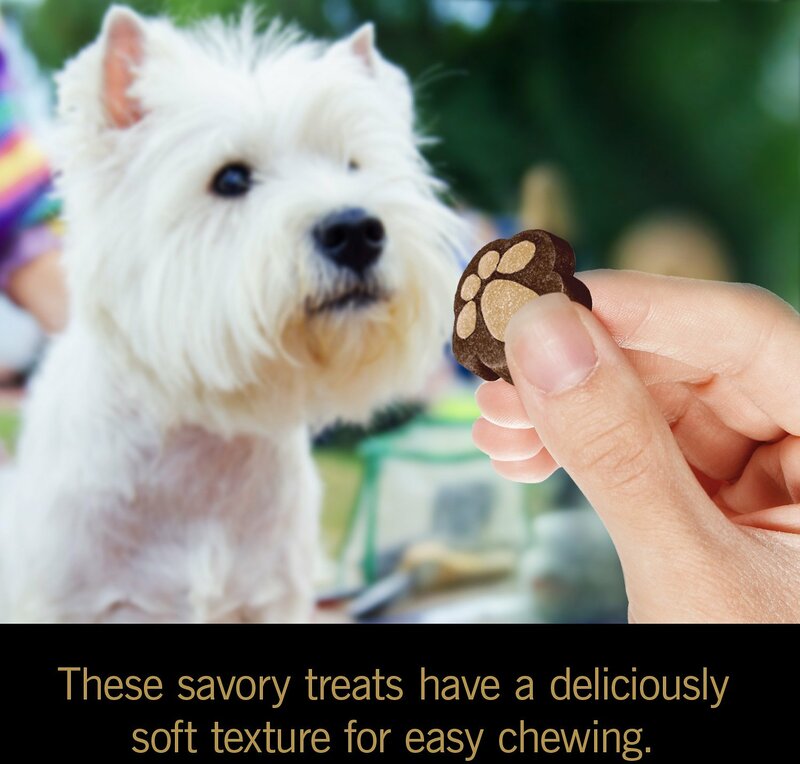 Can also be crumbled over dry kibble to add tasty mealtime variety or entice a picky eater; just seven calories per treat. Convenient resealable bag locks in the flavor and helps keep these moist treats soft and savory. 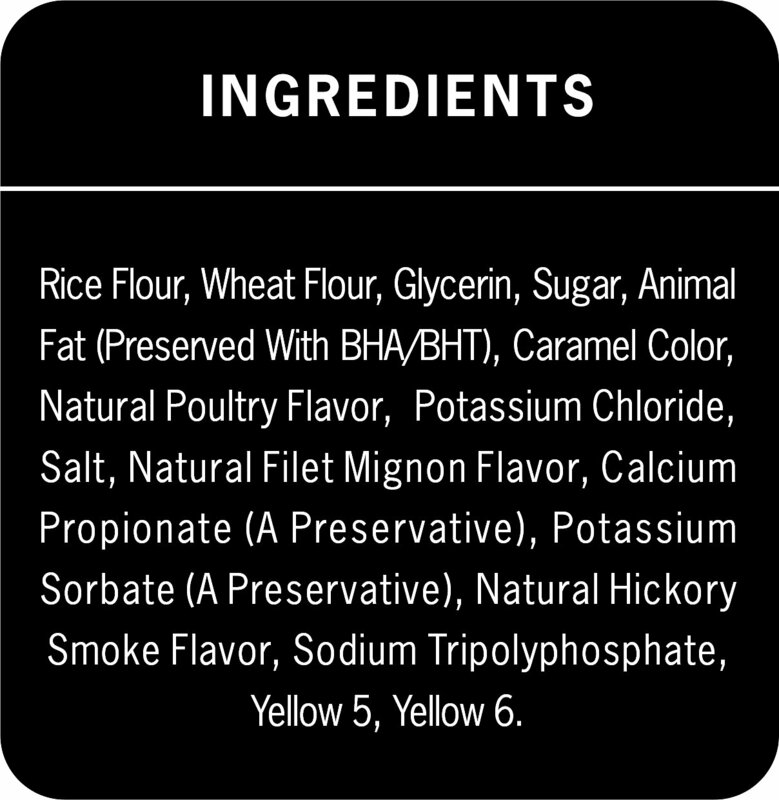 Rice Flour, Wheat Flour, Sugar, Glycerin, Propylene Glycol, Animal Fat (Preserved with BHA/Bht), Caramel Color, Natural Poultry Flavor, Potassium Chloride, Salt, Natural Filet Mignon Flavor, Calcium Propionate (a Preservative), Potassium Sorbate (a Preservative), Hickory Flavor, Artificial Color, Sodium Tripolyphosphate, Titanium Dioxide. 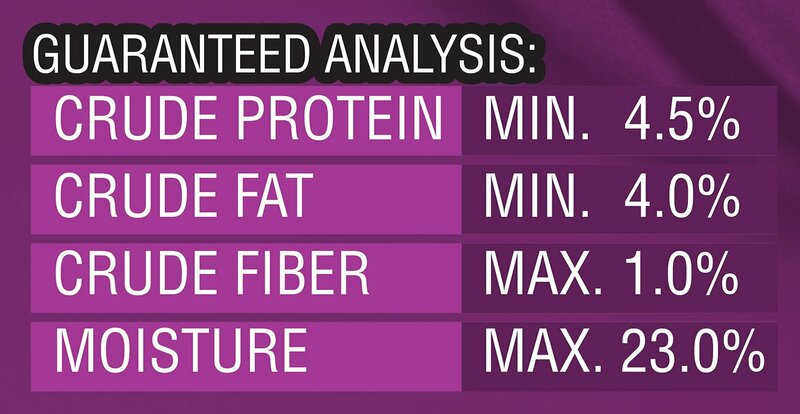 Feed 2 treats per 5 lb of dog daily. Provide fresh drinking water at all times. This is my dogs favorite, favorite treat! He always gets them as bedtime snack and will do any trick to get them! Apollo is absolutely obsessed with these treats. He literally will not eat any other brand of treats. They are so inexpensive for what you get and they are super tasty. 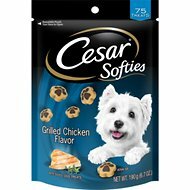 My little Charlie Man , Loves these and I like the size and they are cute treats. Soft treats for my dog that has few teeth. I buy all my cat food and treats with Chewy. Our dogs are so spoiled! Our little girls are so spoiled! 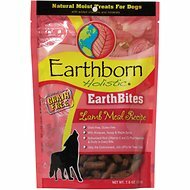 These are the only treats our dogs will eat!! Our pups just love these snickies and were very happy with our purchase ! !